The Lightning has shaped up as maybe the most exciting race of the year, with two-year-olds engaged for the first time since 1993. Join us from 3.30pm AEST for a full preview, live blog and post-race analysis. For the past fortnight, all the talk has been about Boomwaa, who has taken on the monumental task of weight-for-age racing as a two-year-old. It is an extraordinarily rare event where the colt will carry just 46kg and, according to the bookmakers, is a genuine threat in the race. Run over 1000m at Flemington, the Black Caviar Lightning Stakes is over in the blink of an eye. In spring, Boomwaa took out the Group 3 Maribyrnong Plate in an outstanding time of 59.39 seconds to win by three lengths. That was against other two-year-olds and he drops a jaw-dropping 9.5kg here today. With all the fanfare around Boomwaa, we must not ignore Bugatty who is the other two-year-old engaged but less fancied. Bugatty, too, will carry just 46kg but his winning form is a tier below Boomwaa’s. But when it comes to two-year-olds who will have no idea who they are with just 46kg on their backs, they have every chance of becoming airborne in transit. Attention must also be given to the three-year-olds entered – Bernabeu, Brilliant Bisc and Thermal Current. Last week, Bernabeu had a jumpout at Flemington, which left trainer John O’Shea speechless after the colt ran a sub-46 800m trial. Although trials are nothing compared to race conditions, the time simply can’t be ignored considering Bernabeu produced an equally dazzling effort on Cup day, when he beat Iconic by three lengths. The colts are getting plenty of attention, which means the older, proven horses have been overlooked a touch. Samaready is the actual favourite for the race. With an excellent first-up record, we saw her destroy Buffering to the tune of four lengths in the Moir before Buffering came out and won three consecutive Group 1s. 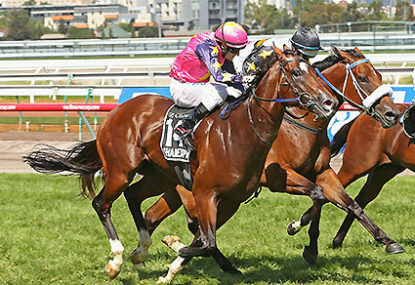 The mare has had one run at Flemington for a win but that was as a two-year-old. Her best career performance was in the Moir, where she simply accelerated off the bend like none other, so it will be interesting to see if she can do the same down the Flemington five. In most years, the favourite for this race would be Shamexpress who is a whole new horse at Flemington. Winning the Newmarket Handicap last autumn before coming back in spring, where he was luckless yet flew home in the VRC Sprint Classic, he is the proven weight-for-age sprinter in this field. Back bigger and stronger, Shamexpress has drawn perfectly, has Damien Oliver onboard and could easily start favourite when the big money starts coming in. Snitzerland has now amassed more than $1.5m in prize money without claiming a Group 1 so she will be out with a vengeance to change that. The mare has not shown the same blistering acceleration she showed when she was a filly but 1000m is her pet distance so if she’s going to break her drought, this is her best chance. The best roughie in the race is Unpretentious, who is three from four running first up and trialled well behind Lankan Ruby who won last week. He’s still unproven at Group 1 level but he’s comfortably defeated some solid Group 2 sprinters and is one to consider for exotics. Overall, this race is wide open and by the jump, any of Samaready, Shamexpress, Bernabeu or Snitzerland could be the race favourite. Don’t blink because you might miss the race.